Refrigeration has many applications, including, but not limited to: household refrigerators, industrial freezers, cryogenics, and air conditioning. Heat pumps may use the heat output of the refrigeration process, and also may be designed to be reversible, but are otherwise similar to air conditioning units. 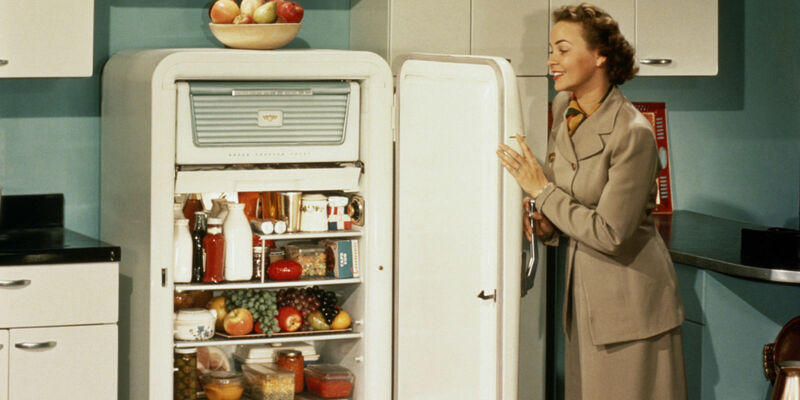 Refrigeration has had a large impact on industry, lifestyle, agriculture, and settlement patterns. The idea of preserving food dates back to at least the ancient Roman and Chinese empires. However, mechanical refrigeration technology has rapidly evolved in the last century. In the past around 4000 years from now, people in India and Egypt are known to produce ice by keeping water in the porous pots outside the home during the night period. The evaporation of water in almost cool dry air and radiative heat transfer between the water and the deep sky that is at a very low temperature (much below the freezing point of ice) caused the formation of ice even though the surrounding air was at a higher temperature than the freezing point of water. There are a few accounts in China about the use of ice around 1000 BC for cooling the beverages. In 4th century A.D., East Indians were producing ice by dissolving salt in water. Because of the very small amount of production, the aforesaid methods were not feasible for commercial applications. Natural ice is limited to certain regions, therefore, the absence of good quality insulation systems in those days forced the man to develop methods to produce ice artificially. Out of many pioneers’ work on refrigeration side, a few are presented here. In 1790 the first British Patent was obtained by Thomas Hariss and John Long. 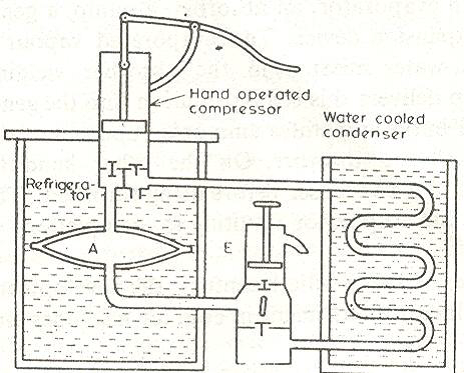 In 1834 Jacob Perkins developed a hand operated refrigeration system using ether as the working fluid. Ether vapor was sucked by the hand operated compressor and then high temperature and pressure ether vapor was condensed in the water cooled chamber that served as the condenser. Liquid ether was finally throttled to the lower pressure, which was then evaporated in a chamber called evaporator, A. With the evaporation, temperature of the water surrounding the evaporator fell down and finally the ice was formed. In this system, either was used again and again in the cyclic process with negligible wastage. The first American patent of a cold air machine to produce ice in order to cure people suffering from high fever was obtained by Dr. John Gorrie of Florida in 1851. In 1860, instead of air or ether, Dr. James Harrison of Australia used sulfuric ether. This was the world’s first installation of refrigeration machine for brewery. In 1861, Dr. Alexander Kirk of England constructed a cold air machine similar to that of Dr. Gorrie. In his machine, air was compressed by a reciprocating compressor driven by a steam engine running on coal. In the 19th century, there was remarkable development of refrigeration systems to replace natural ice by artificial ice producing machines. In the beginning of the 20th century, large sized refrigeration machines were developed. In 1904 in the New York Stock Exchange, about 450 ton cooling machine was installed. In Germany, people used air conditioning in theater. Around 1911 the compressors with speed between 100 to 300 rpm were developed. In 1915, the first two-stage modern compressor was developed. 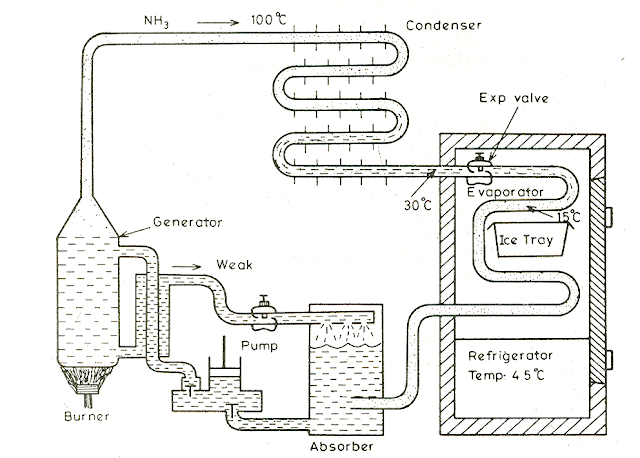 To meet the demand for ice during the civil war, Ferdinand Carre of the USA developed a vapor-absorption refrigeration system using ammonia and water. Carre’s system consisted of an evaporator, an absorber, a pump, a generator, a condenser and an expansion device. The evaporated vapor is absorbed by the week ammonia-water mixture in the absorber yielding strong aqua ammonia. The pump delivers this strong solution into generator where heat transfer from a burner separates ammonia vapor and the weak ammonia returns to the absorber. On the other hand the ammonia vapor condenses in the condenser before being throttled. The throttled liquid ammonia enters the evaporator resulting in completion of the cyclic process. Until about 1920s the development in refrigeration system was restricted to the refinement in the cold-air machines and vapor-compression systems. After 1920s, there has been extensive diversification in the growth of refrigeration systems leading to new developments such as vortex tube, thermoelectric, pulse-tube, steam-jet, centrifugal compression systems, etc. The most important development can be the invention of new refrigerants which were chlorfluor hydrocarbons. This development occurred in 1930 in GE Corporation of USA at a time when Refrigeration industry had begun to stagnate on the use of NH3 SO2 as refrigerant. The chlorfluor carbons offered the advantages of best refrigerants and were proven non-toxic substances in comparison with NH3 and SO2 Other developments took place due to special requirements to utilize waste heat or low grade energy or materials of specific properties for thermoelectric effect. Owing to the likelihood of energy crisis in the future, many commercial units have been developed that utilizes waste heat or solar energy.